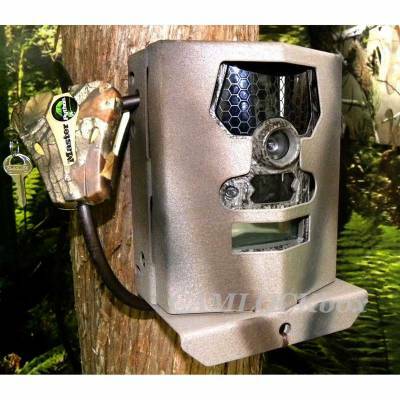 CamLockBox Security Box for Wildgame Vision Trail Cameras. Fits Wildgame Innovations Vision 8 Lightsout (V8B20), Vision 8 (V8i7), Vision 8 Lightsout (V8B7), Vision 8 (V8i20), Vision 12 IR & Vision 10 trail cameras. All-Steel security lock box designed to provide exact camera fit. Allows camera to be taken in & out and still point back to same spot. Powder coated with a camo break-up paint applied. Protect your camera from varmints, bears, weather and theft. Box can be lagbolted, bungeed or belted to the tree.